For Rashes: I try to determine why there is a rash and what kind it is. Is there an allergy? Did they get into or eat something that they could be allergic too? If I know it's allergy related I stop the allergen and use Plantain and/or Itch ointment on the rash (if the rash isn't bothering them I sometimes will just watch it, many times it goes away on it's own) and I give them Kid-E-Soothe since it helps to calm and strengthen the immune system. A allergy is usually the immune system overreacting. Is it a rash that comes and goes in the same general area? The skin is the largest organ we have, it is really amazing when you think about it. Often the body uses the skin as a way to cleanse. Many times if we are overly toxic or the liver is over worked rashes will appear. The body will do whatever it can to keep toxins away from vital organs. Sometimes yeast overgrowth and/or fungus will cause chronic rashes in places. Ring worm or parasites can also be the cause of rashes. Whatever may be going on I have found it best to try to let the body do it's job and to just assist it. Coconut oil is my first choice with about any rash that seems persistent and that I'm not sure of. I choose coconut oil because it's great for the skin, absorbs quickly, is anti-viral, anti-bacterial and anti-fungal.....so pretty much all my basis are covered. I have found that coconut oil clears up most rashes. Obviously if it is an internal problem we need to get to the cause, a liver or colon cleanse may be helpful to clear the body of toxins, a parasite cleanse may be what's needed or we may need to get rid of yeast. It can sometimes be a guessing game I have found it helps to ask someone who has had experience with rashes, usually a Mother with a number of children. ;) They just seem to know these things like if it's a raised hot rash with scabby little pimples it's probably a yeast type rash. If it's a scaly peeling rash it could be fungal or maybe even eczema (which we will talk about in another post). 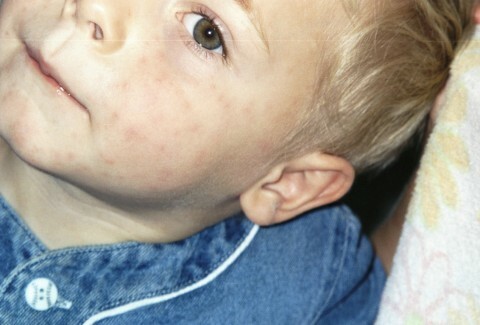 If it's tiny little pimples spread out over a large surface it's more than likely heat rash. If they look more like mosquito bites instead of pimples it's probably hives. Things like that.....;) nothing teaches like experience. I have found that a few drops of lavender oil in a carrier oil like almond or coconut is very soothing and healing on a rash. I'm sure there are other things you can do but we have found the coconut oil works well and being sure to keep things nice and clean on the inside through cleansing and nourishing. Stings and Bites: My all time favorite remedy for bee stings and mosquito bites is Plantain. Plantain is a herb I have used it both fresh and in ointment form. I always have some ointment in my fridge just in case. Also if you know what it looks like (it's a weed and grows all over) or you are weird like me and you transplanted the weed from your lawn to your herb garden.....You can take a leaf and chew it up a bit and stick it right on the bite. The sooner you can apply it after being stung or bit the better. If you get it on soon enough that is all you will need to do. If not I have found a drop of lavender essential oil works great! Obviously if you are allergic or bit by something poisonous get proper medical attention immediately. I hope that helps I do plan to cover other skin issues but thought I would just start with the basic rash, stings and bites. Feel free to comment and ask questions or share what works for you! thanks, I always like to hear what has worked for other people, my son has a bit of a rash and I'm going to try the coconut oil. I've been using coconut oil, yes! Doing something right. Sounds to me like you are one of those experienced moms who've figured it out, you are amazing! Oh yes and if it seems to be a yeast rash, is there something thats good for that too? Emily: Coconut oil also seems to help with that. A yeasty diaper rash my favorite was Gentian Violet (it's a really purple stuff) I also liked Black Walnut Tincture but since it was a alcohol base it would really sting and not make my babies very happy when I put it on. Tea Tree oil helped too and was much more mild but the violet seemed to work fastest (one or two applications) that's why it was my favorite. It's maybe not the most "natural" but much better than like the Monistat type stuff as far as ingredients go. When you have a baby inching and fussy you want it to work quick and painless. Do remember though that yeast is a inside out thing and should be treated internally too probiotics, low or no sugars and things that will help restore a good balance in the gut. Thank you Tammie, I have that purple stuff, GREAT to know, and I am working on the diet too to help my little guy. Anonymous: I would try just coconut oil first it's the simplest be sure it's cold pressed I get mine at Mountain Rose Herbs(http://www.mountainroseherbs.com/index.php?AID=092220). If it doesn't work I would try making the Hard lotion bars....recipe here at...http://www.simplehealthytasty.com/2011/02/hard-lotion-bars.html. I have also known people to find good success with doing parasite and/or yeast cleansing. (because of course problems on the skin are usually coming from the inside out) Also I think that the more whole the diet the better.